challenge: kneel Stowaway and discard the top card of your deck to choose an Ironborn character. This character gains intrigue icon until the end of the phase. challenge: discard the top card of your deck to give +1STR to a character with holy crest until the end of the phase. Limit twice per phase. Each Warship location you control counts as 2 STR during the dominance phase. Neutral character. Cost s0. str 1. Icon = Int, Pow. Silent Sisters gets +1 STR for each character in your dead pile. Neutral character. Cost 2. str 2. Icon = Mil, Int, Pow. Any Phase: Kneel 1 influence to give Jack of All Trades (choose one) a WAR, a NOBLE, a LEARNED, or a HOLY crest until the end of the phase. Neutral character. Cost 3. str 3. Icon - Int, Pow. Response: After you win a challenge in which Godswood Attendant participated, look at the top card of any player's deck. Then, you may discard that card or put it back on the top of its owner's deck. Unique Lannister character. Cost 2. str 1. Icon = Mil, Pow. Unique Baratheon character. Cost 4. str 3. Icon = Mil, Pow. Noble crest. Lord, King. Renown. If Robert Baratheon is the only King character in play, he gains: "Any Phase: Kneel Robert Baratheon to play an 'Any Phase' event card from your discard pile as if you just played it from your hand. Then, shuffle that event card back into your deck." Unique Martell character. Cost 1. str 1. Icons = Int, Pow. If Myrcella Lannister is the only Queen character in play, she gains: "Any Phase: Kneel Myrcella Lannister to choose a Knight character. Until the end of the phase, that character gains an (int) icon and stealth"
"All House" location. Cost = 1. Trait = Kingdom. After a player wins an (intrigue) challenge, that player kneels all copies of Kingdom of Shadows to choose and stand a card with the (Shadows) crest. +1 Gold. Greyjoy character. Cost = 1. STR = 1. Icon = Mil. Trait = Ally. Response: After an opponent plays an attachment card, discard Scurvy Cutthroat from play (cannot be saved) to discard that attachment from play. Response: After you win an unopposed challenge in which attached character participated, attach Veteran Marauder to an opponent's location. 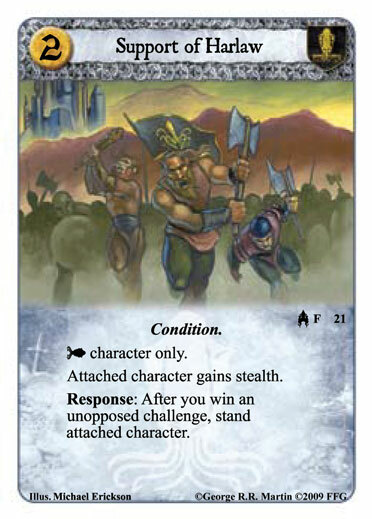 Treat that location as if its printed text box were blank while Veteran Marauder is attached. Unique Greyjoy character. Cost 5. str 4. Icon = Mil, Int, Pow. Immune to events. 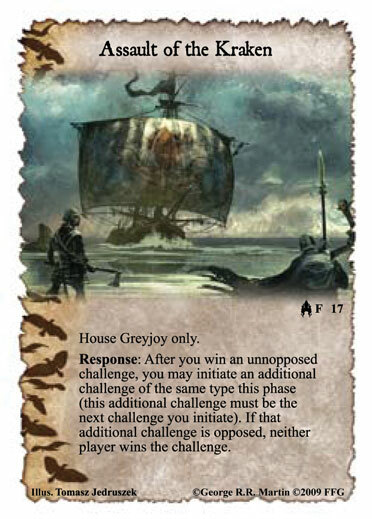 While Euron Crow's Eye is standing, GJ character you control gain stealth. 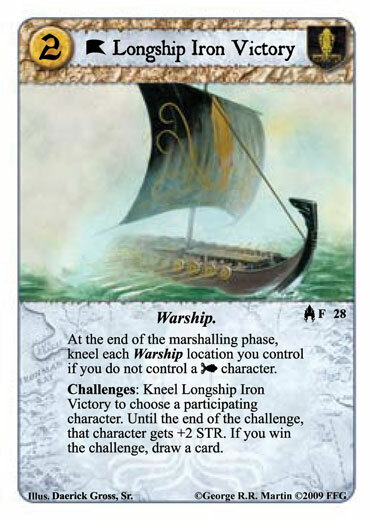 Unique Greyjoy character. Cost 4. str 3. Icon = Mil, Pow. War crest. Lord, Ironborn. Intimidate. Greyjoy character. Cost 4. str 4. Icon = Mil, Pow. House Greyjoy only. No attachments. 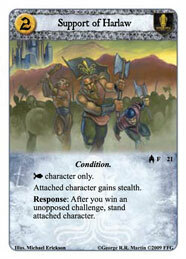 Challenges: You may put Ten Towers Honor Guard into play from your hand, under the control of any opponent. After that opponent wins a challenge in which Ten Towers Honor Guard participated, take control of Ten Towers Honor Guard. Unique Targaryen character. Cost 1. str 1. Icon = Pow. If Viserys Targaryen is the only King character in play, he gains: "Each attachment on Viserys Targaryen reduces the amount of power you need to win the game by 1." 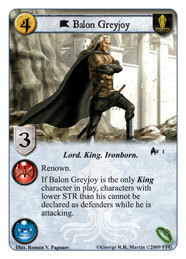 Response: After you win dominance, kneel 2 standing Ironborn characters to choose and stand a GJ Lord or Lady character. Then, that character claims 2 power and you draw 2 cards. Ploty a případně ostatní již dříve zmiňované karty naleznete zde. 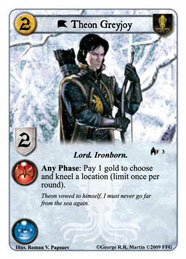 * Shadowcat, Westeros edition C17, has become a card with a shadow crest too. 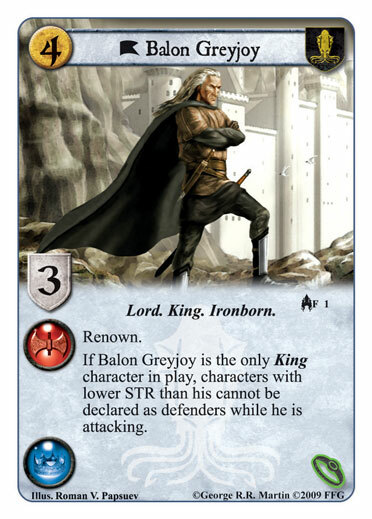 * Victarion Greyjoy (I&F and I&F PS) has the same artwork but the ability is a little different, also he has received a war crest and intimidate. Ten bubeník (Tambor) je reálně takto wordován? Pokud ano, tak ho považuji za designérsky nešťastný krok. Nemá žádnou limitaci, je neunikátní a pro Greyjoy unopposed build znamená vítězství v prvním nebo spíše druhém plotu. Jen kroutím hlavou. Super, tak jsem se podíval na španělský originál a Tambor dělá z challenge unopposed jen, pokud se vyhraje o 4 v rozdíle síly. Uff, tak to jsem si oddychl, divil bych se velice velmi, kdyby Nate vyprodukoval takovou kartu. ještě bych si dovolil říct ře se jedná o reprint z I&F a jedná se o kartu "Drumbeater"